The 500x500m basket double skinned Teikos TS601 glasswasher is constructed from entirely from stainless steel. The double skin creates a thermal wall which reduces heat loss saving you money and lessens operational noise. It is designed for heavy duty use in the busiest of bars. 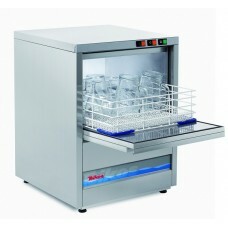 A high quality of build with removable stainless steel wash & rinse arms ensuring thorough cleaning time after time. A selectable 2, 3 & 5 minute wash cycle time allows you choose the cycle time to suit the load. Automatic detergent & rinse injector pumps fitted as standard mean the detergent & rinse aid chemicals are automatically dosed into the machine, all you have to do is make sure the bottles are kept topped up. It is always wise to check the diameter of your plates before you buy a machine. The Teikos TS601glasswasher takes plates with a diameter up to 330mm. During one complete wash cycle this machine uses about 2 litres of water making the electrical & water consumption economical. Please phone or email for any further information, we are always happy to help, contact details below. 8 Litre Manual Water Softener , 8 Litre capacity. 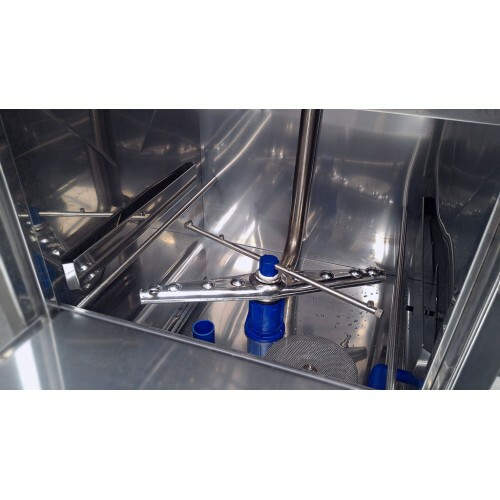 Stainless steel construction, flexible h..
Ourglasswash chemicals have been especially formulated and tested for automatic dose machines £10 ..
Automatic cold water softener, 10 litre capacity, suitable for passthrough dishwashers W275 D450 ..
16 Litre Manual Water Softener , 16 Litre capacity. Stainless steel construction, flexible hose fitt..
Granulated Salt Pack 2 KG for water softeners..
12 Litre Manual Water Softener , 12 Litre capacity. Stainless steel construction, flexible..
Automatic metered cold water softener softener, 10 litre capacity, suitable for passthrough dishwash..